Snickerdoodles are such an American classic and I never heard of them until I moved here! They are the best if soft, and preferably still a little bit warm from the oven. Or, if turned into cupcakes! 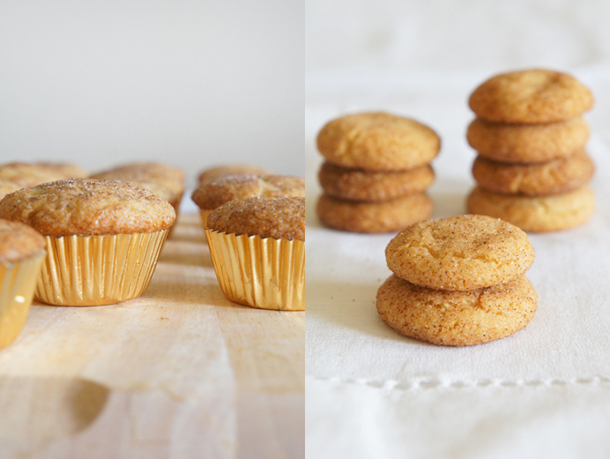 I am so lucky to have found the recipe for “Soft & Thick Snickerdoodles” (doesn’t that sound scrumptious already?) by Sally’s Baking Addiction. Top that with sour cream frosting and put it on a cinnamon muffin, and your in cupcakes heaven! I made my snickerdoodles a little bit flatter for these cupcakes so I could stack them better. If I were to make the cookies alone, I would definitely make them thicker since that makes them softer. The recipe below will also make more cookies than needed for the cupcakes, but hey, who cares? 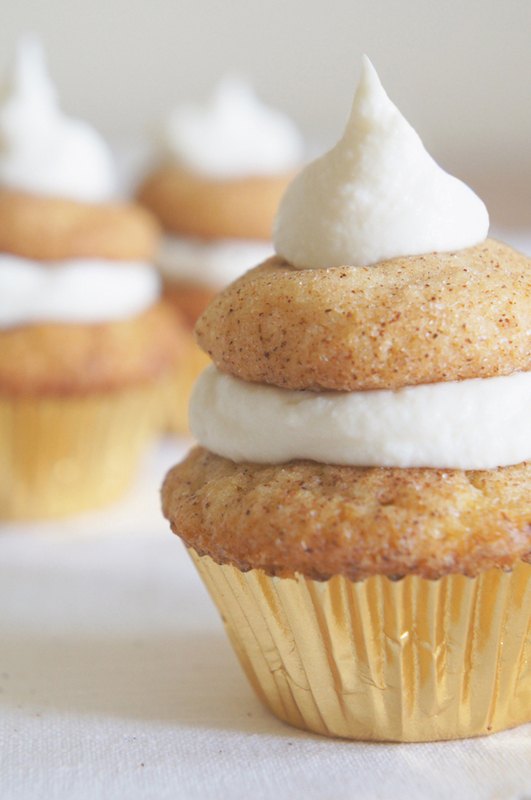 This recipe for Mini Snickerdoodle Cupcakes with Sour Cream Frosting features my favorite soft and fluffy Snickerdoodle cookies! It's a must-try. Preheat oven to 350°F / 180°C and line two large cookie sheets with parchment paper. To make the cookies, cream the softened butter in your stand mixer with a paddle attachment until smooth, then add the sugar and beat until fluffy and light. Mix in the egg and vanilla. Scrape down the sides as needed. Set aside. In a separate bowl, whisk together the flour, baking soda, cinnamon and salt. Slowly add the dry ingredients to the wet ingredients while running your mixer on low speed. Don't overbeat! The dough will get thick and you might turn off your mixer and knead the dough until all ingredients are incorporated. In a small bowl mix cinnamon and sugar together. Roll the dough into ¾ inch sized balls and coat them with the cinnamon-sugar mix. Place the balls on the baking sheet and bake for about 10 minutes and let them cool down. For the cupcakes, preheat oven to 350°F / 180°C and line a miniature cupcake trays with paper liners. Sift together flour, baking powder and cinnamon. Set aside. In your stand mixer with the paddle attachment, cream butter and sugar on medium high speed for about 2 minutes, then add the eggs, one at a time. Keep beating for another 2 minutes. With your mixer running on low speed, add the flour mixture in three additions and the milk in two additions. Fill the batter in the baking cups, about ¾ full and bake for about 15 minutes, until a tooth pick inserted in the middle comes out clean. Let the cupcakes cool down. For the frosting, cream the butter with the paddle attachment on high speed until fluffy. Add 1 cup of powdered sugar and keep beating for another 2 minutes. Add the sour cream and the rest of the sugar and continue on medium high speed for 2 minutes. In case your frosting is too thick, add some milk, if it is too liquid, add some sugar. Place some of the frosting on the cupcakes, top with a cookie and decorate with a dab of frosting. These are so cute! I love the way you’ve frosted them! they sound yummy and so cute! 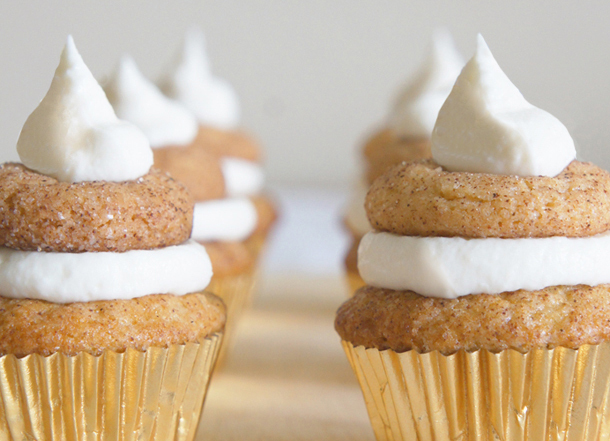 Snickerdoodles in cupcake form? Yes please! These cupcakes are adorable with the little cookie on top! Never heard of sour cream frosting before, but it sounds yummy! Do you mean cupcakes in a mini muffin pan or the 2.5in. ones? If you mean the real little ones, any idea how long it takes to bake them in the pan with the 2.5 in. wide wells? About how big do you roll the balls for the cookies? You wrote: “Roll the dough into size balls and coat them with the cinnamon-sugar mix.” I think you might be missing a word. Would love to try these and I’m willing to wing it, but would love something more specific. Thanks! I am using a mini cupcake pan with molds that measure 2 inches at the top. I think thats the regular mini cupcake size. I’m not sure how you were able to get a full cup of sour cream into this frosting recipe?? Is that the correct amount? Mine ended up being a glaze and that was with double the powdered sugar. I searched other recipes and they seem to be using 2 Tblsp to that amount of butter and sugar. Really bummed. The flavor was amazing though. I had never thought to use sour cream, so thanks to turning me on to that, but I will have to use a different recipe. Same issue here. I threw half of it away and then added quite a bit more powdered sugar. I wish I had read your comment before I started!! HI Melanie, that is really strange, I made those again not too long ago and it worked! I am really clueless as to why it didnt work. I’m so sorry! Mine ended up being kind of soupy too, so I just poured it over the cake I was making…still very tasty though. I made these a while back and just made them again for christmas, the whole fam loves them!